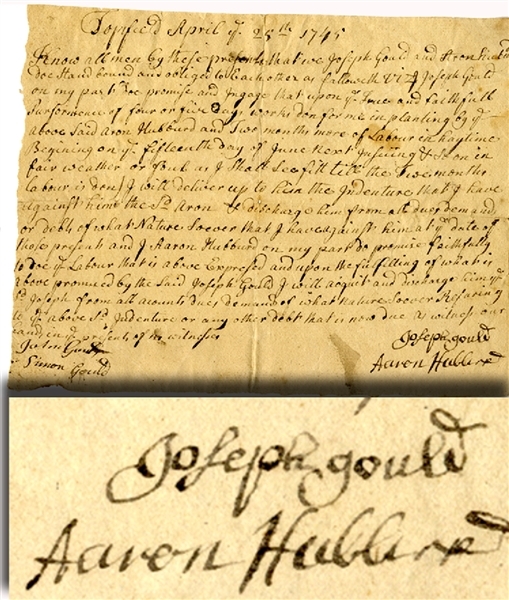 Document signed by “Joseph Gould” and “Aaron Hubbard”, Topsfield, April 25th, 1749, being a labor contract whereby Gould is engaged to plant for four to five days to be released from a debt owned by J.Aaron Hubbard. Joseph was a farmer who, on December 5, 1774 was elected Captain by the citizens of Topsfield of one of the two Militia Companies. It is recorded that Captain Gould was one of those who, on April 19, 1775, left his plow in midfurrow and galloped off to Lexington and Concord to help drive the Redcoats back to Boston."